I am always interested in new recipes that I can try out on my indoor BBQ. I have never tasted a cherry salsa, so this one definitely drew my attention. It is very light and refreshing and although I served this as a starter in the middle of winter with a glass of bubbly, I think this would go down a treat in the summer months as well. Note that you do not have to grill the baguette on a BBQ; you can easily use your grill pan with the same results. 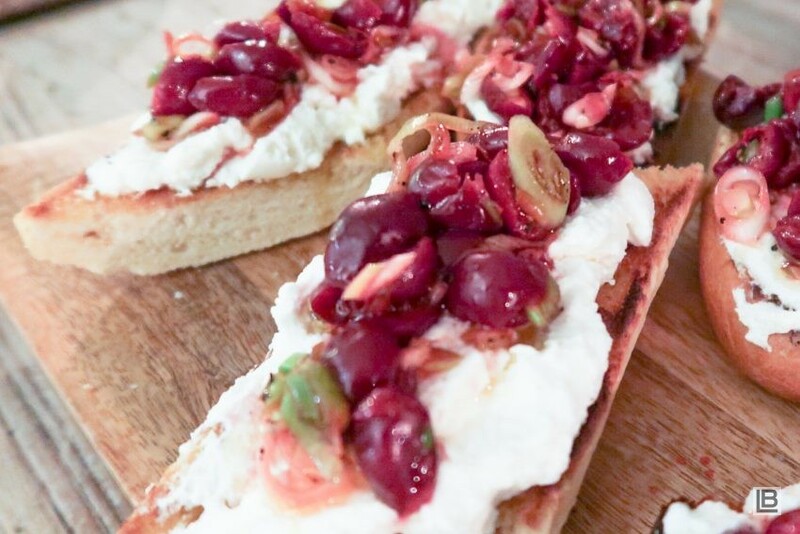 This recipe was sourced from Charred bread with ricotta and cherry salsa. Toss the white parts of the spring onions and lemon juice in a bowl and let sit for 10 minutes. Add the greens of the spring onion, cherries and ½ cup olive oil and toss gently. Season with salt and pepper. Prepare your grill or grill pan to medium heat. Brush cut side of baguette with olive oil and toast until golden brown. Cool baguette for a minute then spread a generous amount of ricotta over both pieces. Sprinkle lightly with flaky salt and cut each length into 4-6 diagonal pieces. Arrange on a platter and with a slotted spoon, arrange cherry salsa on top. The salsa can be made up to 6 hours ahead. Note that I did not use fresh cherries on this recipe as it is out of season. Instead I bought the frozen cherries from Eldorado in Norway, thawed it, drained the juices and used it the same as the recipe. Thank you so much! i would love some feedback if you have tried it.